Any American can get a note from the White House congratulating them on getting married, but for most people, getting married at the White House isn’t a reality. There have been White House weddings—17 in all, according to the White House Historical Association—but they’ve mostly been confined to members of the president’s family or, in two cases, people close to the president. First Daughter Nellie Grant had “the first really grand White House wedding,” writesthe Association, on this day in 1874. President Ulysses S. Grant and his wife redecorated the East Room especially for the wedding ceremony, writes the Association, adding gold leaf accents and replacing chandeliers from the Andrew Jackson years. Big sections of the House were turned over to preparations for the wedding, the Association writes, and the decorations ranged from a big wedding bell made of pink roses to red-white-and-blue bunting. At Grant’s wedding breakfast, held in the State Dining Room, the impressive menu included such delicacies as “aspic of beef tongue” and “Wedding Cake iced with Doves, Roses and Wedding Bells,” according to another Association piece. “The wedding breakfast menu was printed in gold on white satin and given to guests as souvenirs of the occasion,” writes the Association. “It was the first wedding to be held in the White House in thirty years, since President Tyler married Julia Gardiner,” writes Edwin S. Grosvenor for American Heritage. Grant’s famous nuptials were “perhaps the most celebrated nuptials of the nineteenth century,” he writes. The White House weddings of later First Daughters, like President Theodore Roosevelt’s daughter Alice, were big news. The first White House wedding was the wedding of Lucy Payne Washington, who was the sister of Dolley Madison. In the 1812 ceremony, which was probably held in the Blue Room according to the White House Historical Association, Washington married Thomas Todd, a Supreme Court Justice. The most recent wedding at the White House was the 1994 wedding of Anthony Rodham, First Lady Hillary Rodham Clinton’s brother. He married Nicole Boxer in the Rose Garden, before a black-tie wedding dinner was held in the State Dining Room. 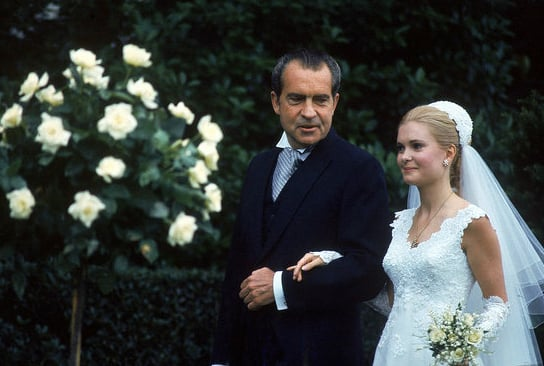 It was the first since Tricia Nixon, the daughter of President Richard Nixon, got married in the Rose Garden in 1971. Nixon’s wedding to Edward Finch Cox was highly publicized, and she appeared in her wedding dress in Time magazine not once, but twice. White House weddings in general stopped being much less common in the second half of the twentieth century: after three happened in the 1910s, the next wedding was that of Harry Hopkins—President Franklin Delano Roosevelt’s assistant and one of only two non-Presidential family members to get married at the White House—got married in FDR’s study in 1942. There are a lot of reasons to have a wedding at the White House if you can, former social secretary to Jacqueline Kennedy Letitia Baldridge told Sheryl Stolberg for The New York Times. World-class catering and staff are at your fingertips, along with the White House’s own florist and social secretary to handle all the decorating and inviting. But there’s one good reason not to: privacy. “Historically,” Stolberg writes, “such affairs have been feel-good occasions for the country and the commander in chief, casting presidents in the sympathetic role of father.” But there are times when the First Family, or its relatives, just want to fly under the radar. Next articleWhat Makes a Great President?